Jalpaiguri/Kolkata, Feb 9 : Prime Minister Narendra Modi and West Bengal Chief Minister Mamata Banerjee exchanged a flurry of verbal punches on Friday, as he accused her of trying to save those involved in ponzi scheme scams, alleging that opposition parties were coming together to protect fraudsters, touts and criminals. Banerjee hit back by calling him the "master of corruption". Launching a scathing attack on Banerjee, the Prime Minister wondered why she was so scared of the probe into the scam, and charged her with inviting leaders from all over the country against whom there are either serious allegations of graft or those who were trying to protect the "corrupt" and said none of the offenders will be spared. "The people of Bengal want to ask her why she is so scared of the probe into the chit fund scam. Why is she holding dharna for those who are accused of callousness in probing the scandal?" Modi questioned. "I want to assure all the families who suffered in the Saradha, Narada and Rose Valley scams that the 'chowkidaar' (guard) will not spare anybody -- be it the looters or their protectors, no one will be spared," Modi said. Refering to the January 19 rally of opposition leaders in Kolkata, Modi said: "These leaders came together to protect the fraudsters, touts and criminals... They can assemble as many people as they want to hold dharnas, and gather as many leaders as possible, the people who looted the poor will be punished". 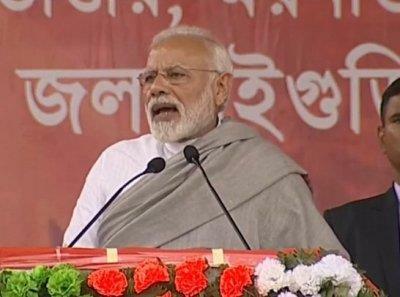 "Obstructing rallies, refusing to allow helicopters to land and attacks on BJP functionarie are signals that the land is slipping from under the Trinamool's feet," Modi said, evoking cheers from thousands of party activists present at the rally ground. In Kolkata, Banerjee minced no words in returning the fire, as she called Modi "master of corruption and arrogance", and one "used to blaring out a bunch of lies". "Country has not seen any person as corrupt as Modi. From Rafale to the scheme of 59 minutes loans for MSMEs, to demonetisation, Jan Dhan -- these are all scams. All the institutions have been destroyed. "He is a master of corruption, arrogance and used to blaring out a bunch of lies. His standard is so below par, we cannot imagine it even. We respect the chair but not Maddy babu," Banerjee said, distorting Modi's name. Describing the Centre's plan to take action against five senior police officers who were involved in the face-off between the Kolkata Police and CBI officials as part of "campaign" before polls, Banerjee said the Centre cannot take action against them, as they were state officers. Banerjee also found fault with Modi for inaugurating the circuit bench of the Calcutta High Court in north Bengal's Jalpaiguri, alleging he was "doing politics" by inguarating projects "hurriedly" ahead of the polls.